Even though I’m a hunter/jumper person, I’ve always had a soft spot for the Arabian. The very first horse show I attended was an Arabian competition, and I still remember that experience vividly. I was 5 years old, and my friend and I spent lots of time in the stables afterward just petting the horses. One exhibitor, noticing our passion for horses, gave each of us a ribbon out of the collection she had won. I had that pink ribbon in my bedroom for many years, even after I started winning ribbons of my own. So, it was especially rewarding to spend time photographing Arabians this past year. For this week’s A-Z Archive letter “S,” I couldn’t help but choose a photograph of Spike, an Arabian stallion I photographed several times last summer. 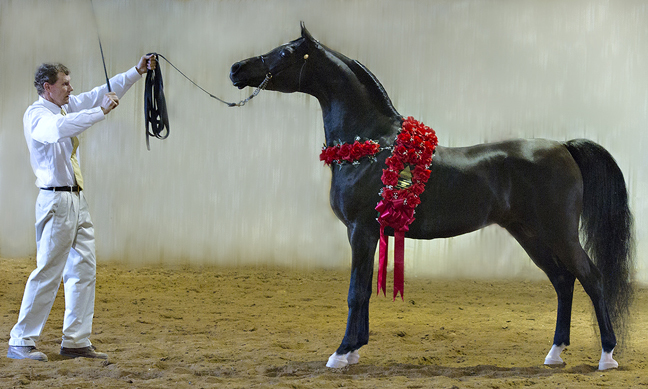 He’s a past national champion (hence the red flowers he’s sporting) and one of the most beautiful horses I’ve ever met. Such a beautiful horse! Fun to remember moments from childhood and realize the influence and inspiration they provided.